Senate leaders, facing a determined Senator Rand Paul, adjourned the chamber until just after midnight, conceding they could not prevent at least a short-term government shutdown, which will begin Friday morning. Senators are still expected to vote in favor of a far-reaching budget deal in a series of votes that will begin around 1 a.m. The House is to follow before daybreak, though the outcome in that chamber is less certain. If the House approves the deal, the government would have reopened before the workday begins, reports The New York Times. He delivered floor speech after floor speech in which he decried out-of-control government spending. It is only a speed bump against the deficit increasing budget but it is good that someone is nit afraid to speak out against the government spending juggernaut. The House has passed the budget deal and ends government shutdown. President Trump has signed the legislation. The new out-of-control spending is now law. 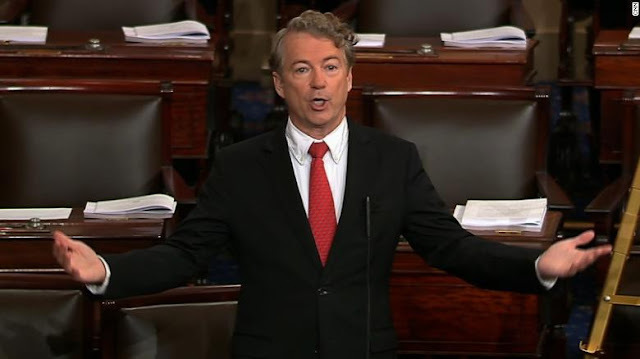 Rand is being the Rand a lot of us were hoping he would be last presidential election. While I hate US politics and despise politicians, Rand has been it seems the single consistent voice for Liberty in US politics. Go for the throat Rand! Strike the Root! He's definitely maturing as a politician and showing some courage. Hopefully he can cause some change, already has a little. He really needs help to accomplish anything lasting, America is too far gone for that.